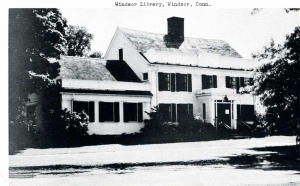 Description: Black & white photographic postcard of the Windsor Public Library, Windsor, CT. Built in 1777 by Col. Oliver Mather as a private home, the building was purchased in 1901 by the Windsor Library Association for use as the Windsor Public Library. It is located at the south end of Broad Street Green in the center of the town of Windsor.